When you define a custom control, you may define some custom dependency properties. For each property that you define, you specify metadata for your new dependency property, including default values. You may also want to specify default values for dependency properties used by your class, but defined elsewhere. In the code fragment below, we’re defining a custom shape that inherits from the Shape class. We don’t want the user to have to provide values for the Stroke and Fill properties, so we use the OverrideMetadata method to provide default values. Note that the user can still provide their own values for these properties. // Remainder of custom control here..
One of the attributes of dependency properties in WPF is that they support inheritance of property values within a tree of user interface elements. Controls (dependency objects) within the tree that make use of a particular dependency property can set a property value locally or retrieve a value from an element higher up in the tree. The local value takes precedence over the inherited value and then in turn applies to all elements “further down”. (There are a number of other places from which a dependency property can get its value). Below is an example. FontSize is set to 20 for the top-level Window. This value is use for lower-level elements unless they set their own value. The GroupBox sets FontSize to 14, which then applies to it and elements under it. 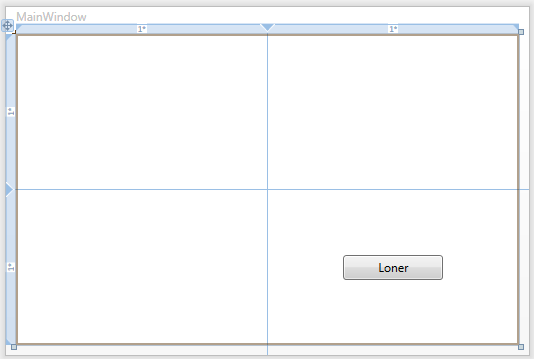 Within the GroupBox, the second Label sets its own value for FontSize. 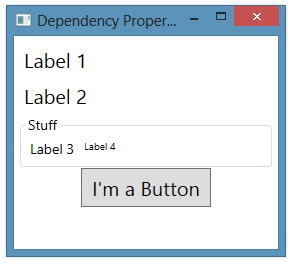 <Button Name="btn1" Content="I'm a Button"
See this post for another example of dependency property inheritance. When you implement a custom dependency property and you register the property by calling DependencyProperty.Register, you specify some metadata for the property by passing it an instance of PropertyMetadata. This can be an instance of the PropertyMetadata class or an instance of one of its subclasses. The differences are shown below. IsAnimationProhibited – disable animations for this property? AffectsArrange, AffectsMeasure, AffectsParentArrange, AffectsParentMeasure, AffectsRender – Should layout calculations be re-run after property value changes? Inherits, OverridesInheritanceBehavior – Does inheritance work for this property? 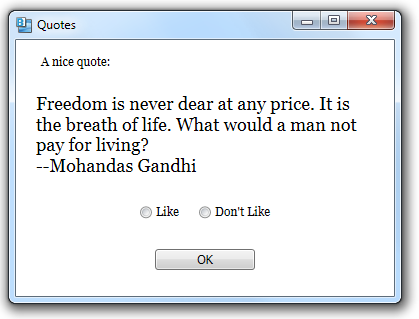 Journal – Store this value when journaling? SubPropertiesDoNotAffectRender – Check properties of this object when layout changes? Recall that you can implement a dependency property if your class inherits from DependencyObject. Here is a complete example, showing how to implement a dependency property.